This year, I'm thankful for so many friends with gardens. It seems to be that time of year when everyone is getting way more zucchini than they want and are graciously passing it off to our household. We just moved into a new place in the middle of the summer and are hoping to have our own garden next year. But in the meantime, we'll gladly accept all your extra veggies. I was starting to get a little tired of straight up zucchini and thought it was time to make some zucchini bread. Spending summers on Cape Cod we had a big garden and always had tons of zucchini, which meant we constantly had (chocolate chip) zucchini bread in the house. And while I love Gram Gorham's recipe, I wanted to make something that was less of a dessert bread and more appropriate for breakfast. For me, I know muffins are better for my portion control (although I'm pretty sure I ate all the muffins before Colin even found them- talk about control, right?). For this recipe I used kefir instead of a classic milk and they came out nice and moist. Have you tried kefir before? I love it! It's a fermented, drinkable yogurt- like product and is a great source of probiotics, protein, and calcium. This recipe also uses just a 1/2 cup of sugar compared to the 2 cups in Gram's (any many others) classic zucchini bread. I used siggi's dairy filmjolk (or kefir as we call it in the US), which is a staple in Sweden. I love it in smoothies to add extra protein and creaminess or lately I've been eating it over seven sundays muesli. 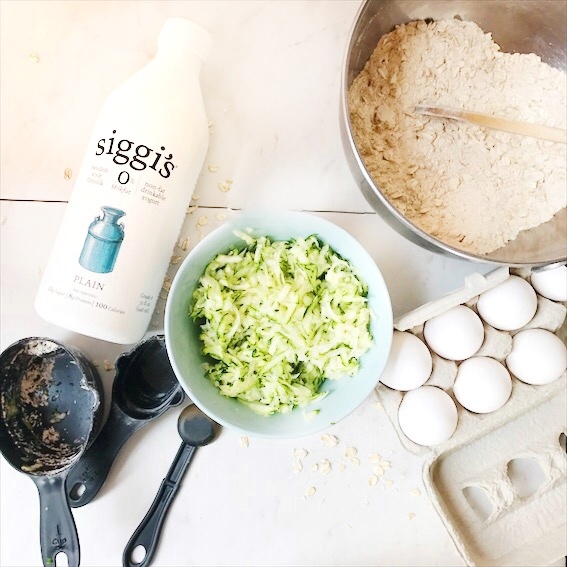 siggi's products aim to be as low in added sugars as possible (remember all dairy has naturally occurring sugars - lactose). So, while these muffins are higher in protein and lower in sugar than the classics, they are not short on flavor or moisture. 1. Preheat oven to 425. Grease your muffin tin. 2. Grate your zucchini over a dish towel and squeeze to remove water. 3. Combine the dry ingredients in a small-medium sized mixing bowl. 4. Combine the wet ingredients in a large mixing bowl. Whisk until well combined. 5. Gradually add the dry ingredients to the wet ingredients. 6. Fold in the zucchini and chocolate chips. 7. Fill the muffin tins about 3/4 full. 8. Bake for 10-15 minutes. Check at 10 minutes to see if fork or toothpick comes out clean.